Bennett was born at 23 weeks gestation weighing 1 lb 6 ozs and was 12 1/4″ long. To summarize his NICU stay, he was in 109 days. PDA surgery at 10 days, ROP surgery at 2.5 months, double hernia repair at 10 months. On high frequency vent 6 weeks, few days on nitric, PIE resolved (short course steroids) but no chest tube, conventional vent month, CPAP two weeks, 2 days steroids weaning off vent, home on 1/4 L. oxygen (off and on, off up to month at time) until 10 months/6 adjusted. His neural ultrasounds in first couple weeks were all clear but at month he had Grade I bleed on left side that appeared to be resolved at follow up scans. He had couple infections in NICU but after the PDA & PIE thing in the first three weeks, he had a relatively uneventful stay and never gave us reason to believe he wasn’t going to stick around. It was a month after he came home that he had a two week PICU stay with RSV in July, on vent there and ribavirin, when 5 months/1 month adjusted – that’s when it seemed we were going to lose him, but once again he amazed everyone and pulled through. Once home Ben received speech, occupational, physical, feeding, and vision therapy services for several years. We enrolled him in programs for adaptive PE & swimming and a therapeutic horseback riding program. He received follow up care from his pulmonologist, retinal specialist, ophthalmologist, a CP clinic for assessment, and his pediatric surgeon (for another surgery before he turned one.) His NICU discharge doctor continued as his primary care doctor for a few years before discharging him to our pediatrician. Update January 2016: Ben is now 11 years old! His gross & fine motor skills are age appropriate, speech & hearing are normal, social & self help skills are appropriate. Lungs are totally fine, he gets maybe one cold every other year. He does the swim & PE program with all his siblings. He has no cognitive or learning issues. He’s a voracious reader and his math skills are at level, he writes poems and stories, he draws pictures and sings all the time, he’s affectionate and funny. His eyes are a challenge. Because of this we’re getting some services to help with skills made more complicated by the vision changes, like cooking or crossing the street. We’ve been encouraged to help Ben see a variety of things as his eyesight declines. To help with that he’s created a wish list of places to go and things to do! My son, Dylan, is 13 now and the day he was born, we immediately noticed something was not right with his eyes. He did not walk until he was 2 1/2 when he finally received his first pair of glasses…what a glorious day for his dad and I as well as Dylan! Every year his prescription has at least doubled, twice it quadrupled. The doctors have told us that he will never be able to drive and that he will eventually lose his eye sight totally. Like your family, we have embraced the diagnosis and we, too, have been taking our son to do various activities that he wants to see, knowing that one day he will not be able to see. It breaks my heart that this happens to children but my son is at peace with the diagnosis and is just taking in all the sights…for now. I will lift your family, and especially Ben up in prayers! And remember, you do not have to see to be AMAZING!! Jennifer – thank you. From one parent to another facing a similar challenge, your words meant so much. Thank you! You should post on https://www.indiegogo.com/ as I’m sure many people would like to donate, and that site makes it very easy to. I saw ben’s story on 9 news here in Denver. Ben is a brave and inspirational young man. He has become my new hero. I wish with all my heart their was something I could do to help this amazing child. He will remain in my thoughts and prayers. If your interested, here is a link to the story. Ms. Heidi I have kids of my own, I wish you all the best with Ben. He is a bright and strong young man, I am sure he’ll be able to handle whatever challenges are ahead of him. Good luck to you and your family. We would love to have your family visit our American Foundation for the Blind Center on Vision Loss in Dallas. Where we showcase environmental designs and over 500 devices to assist people with vision loss. Please call for an appointment 469-522-1802. I am also a mom of preemie triplets(two survived),. 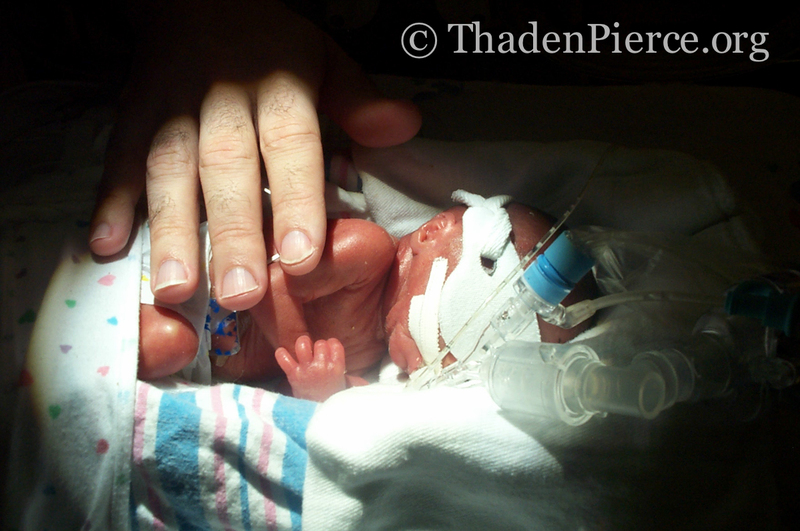 Ben’s journey through the NICU was very similar to my son Michael. Both of our sons are now 21 and doing amazing!!!!. My prayers are with Ben and your family as you go through another challenge, and come through as champions. All the best Ben , I am glad I came across your story today, truly inspiring. Hi Heidi! Sending thoughts and prayers for Ben and your whole family! HUGS from Bangor, Maine! Hi Heidi, My son was not premature however was born with a very serious eye condition called Peters’ Anomoly which causes corneal opacity, he has had corneal transplants in both of his eyes when he was an infant. My son is 13 years old now and has won all of his battles, he plays tackle football and hopefully in a few years he will tackle the hurdle of learning to drive a car. Ben and your family will be in my prayers I hope that Ben is granted all of his wishes he sounds like an amazing child. I know you will be ok. Just have faith and God will see you through. One day at a time. I pray al you wishes come true. Enjoy Washington ,D C.
I am in absolute awe at this bright and exceptionally brave little boy you have. I was skimming through bucket lists when I came across Ben’s story and it was left utterly humbled. You’re family unit truly is an inspiration. Good Luck, I hope you can squeeze as many things into your journey together. Sending my best from Scotland, UK. I don’t think I could say how I feel any better than Jodie Falla. Bless you, Ben. I can’t imagine how hard it must be to face losing your sight. My family is looking over your list and if we can help in any way to fulfill even one of your wishes, we will do it. Keep your chin up, sweetie. You are so very loved by your family and friends and by people you don’t even know! I too fight blindness, I am in my 40’s and still waiting for the day I cant see’ lived a awesome life even with very little sight .I had several surgeries to keep what little sight I have left.got married in my 20’s raised three children , had a good career, seen my grandchildren, visited many place in my life time.well any way, im just telling you this because life doesn’t have to stop for you I achieved all my bucket list and so can you .keep up the good work helping people and getting you bucketlist complete godbless. Ben is a true miracle what an amazing story! I love his birth video it’s beautiful!! I just came across your blog and reading this gave me chills. My son was born at 24+5 and just turned 2 yesterday. Reading about how well Ben is doing gives us so much hope for our son’s future as well. We are so inspired by your strength and dedication to help Ben live life to the fullest in whatever way that means for him. Thank you for sharing your story! I was born a premie too, ~31 weeks which was very early to survive at the time (lung surfactant was not approved for human use in the US until several years after I was born). I lived the first few months of my life in the NICU as well and had to go home on a heart monitor so that when my heart stopped or beat irregularly my parents could know to call for help and try and resuscitate me. I graduated from medical school and am starting a residency in Ophthalmology. I am doing research on pediatric vision loss and hope to help my fellow premies in the future. Ben’s story really touched me, and I think that what you as a family are doing is amazing. First of all. I’m sorry for my bad english. I was touched by his story. Could put on the wish list the city of Bonito, State of Mato Grosso do Sul in Brazil. And an explosion of color and wildlife. I recently read your sons story and I’m getting ready eyed just writing this. It’s amazing how a child his age is going through such a struggle but he doesn’t show it like most would. I’m not a mother yet so I can’t imagine what you and your husband are going through but I appauld you for trying to make all his dreams come true. Your in my prayers and I hope you continue to be blessed. I red your story in a German news paper (Welt Online) and I hope that you will work through your wish list. I would like to help you and your family to do so. Is there a donate account which I can transfer some money to?